Chief spokeswoman for Canadian Prime Minister Jean Chretien blasts president. White House refuses comment. Canadian Prime Minister Jean Chretien has rejected an offer by his chief spokeswoman to resign after being quoted as calling President George W. Bush a moron. "She has great affection for morons . . ."
Francoise Ducros reportedly made the remarks during this week's NATO summit in Prague. PM Chretien downplayed the incident, telling reporters that nobody in the U.S. delegation made reference to the comments during several meetings this week at the summit. "He is a friend of mine, he is not a moron at all." Chretien maintained that Ducros, who is a former practicing psychologist who worked with the mentally handicapped, uses the word "moron" regularly. "She meant no harm, and assures me she has great affection for the many morons she has encountered therapeutically over the years." The White House denied rumors that Mr. Bush was so upset he tried to order a nuclear strike on Montreal. 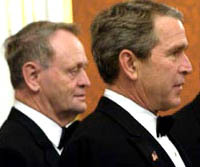 An unidentified spokesperson also denied reports that Cheney had to be called to calm the president and stop the attack. "There is no truth to reports that the vice president interceded to halt either a nuclear or conventional attack on Canada. However, the president is keeping his options open. Right now he is more concerned about Saddam Hussein." In an apparent effort to sooth tensions, Chretien produced a clinical chart (right) prepared by Ducros which placed her remarks in a clinical context. She earlier had explained to a group of British journalists that terms like "moron" and "imbecile" have scientific meanings, and "were not intended to be used to insult people or cause pain."